Cantilever Racking is suitable for long and heavy products, they are fully adjustable and support single or double sided racking. Often used in timber yards, woodworking shops, and plumbing supply warehouses. They are the ideal solution where storage of items in varying lengths is required. Racking is specially designed to provide uninterrupted storage for items such as metal beams, pipes, moulding, wooden planks, and metal or plastic sheets. Systems are designed with the weight and height of your merchandise in mind ensuring a cost effective solution. All systems are fully adjustable based on pre-drilled upright centres. So your racking can change with your needs. Systems can be finished in a range of standard colours or can be galvanised for use in outdoor storage applications. Increasing the CAPACITY of your building. REDUCING the floors pace required. REMOVE the need for double handling or more. ORGANISING your Goods In & Out areas. We have expertise to share with you and we can help enhance your business and improve profitability. Being specialists in the storage of long and heavy products we have particular knowledge of the steel stockholding industry. Offering advise from a background of having assisted in the efficient layout of numerous sites in the UK and internationally for both local industry and large multi-site and multi country organisations. 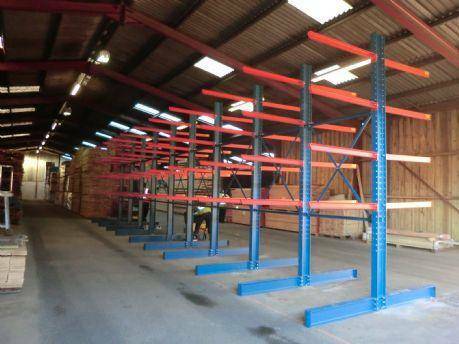 Our team will design a system that best suits your needs.Our Cantilever Racking systems are recognised as the leading products in the industry. A site visit can be arranged to one of our customers sites so you can see their systems in operation and work flow can be observed if required. We understand capital outlay is a big decision, we can offer a lease rental agreement at excellent rates so you can spread payments over a number of years and fund it from the savings that will occur from your investment. To discuss Cantilever Racking in more detail either complete the form below or call us and we’ll do the rest.